In a world where Donald Trump—yes, that Donald Trump—is the president, each day can seem like, as John Oliver put it on Sunday’s Last Week Tonight, being strapped to a nauseating, out-of-control carousel manned by an “unstable, race-baiting carny.” So it’s tempting to kick any simmering problems down the block while we deal with the fact that the White House is currently occupied by a semi-literate, white supremacist-cuddling, social media-addicted TV junkie game show host in the pocket of a hostile foreign power. Sadly, as Oliver shows in his harrowing main story of the episode, one particular tin can has been kicked along for more than 70 years, even though said can is radioactive, unstable, cancer-causing, and will remain all of those things for the next 250,000 years or so. Yep, it’s nuclear waste, a ticking (or Geiger-counter-clicking) time bomb weighing tens of thousands of tons, stored in crumbling “temporary” sites scattered all over the country, and gradually poisoning the environment as American politicians continue the decades-long policy toward storage and disposal with a combination of NIMBY posturing and the wishful thinking of children hiding from the boogeyman by squeezing their eyes shut and plugging their ears. Oliver shows how never-meant-to-be-permanent sites are contaminating greater and greater areas (the infamous Hanford site in Washington state holds the title of “the most polluted place in the Western Hemisphere”), and are alarmingly leaking into the water table and food chain. This last point, as Oliver points out, has resulted in the water near a seeping South Carolina* nuclear site spawning—hold on for the scariest sentence ever (especially if you’re Sterling Archer)—radioactive alligators. Thankfully, there are, as yet, no reports of a Godzilla-style scenario, but Oliver reports the rather more mundanely horrible consequence of people in that area enduring an epidemic of various deadly cancers. The solution is, as Oliver states, a “nuclear toilet” to safely store the deadly by-products of nuclear energy and weapons production, something that, in the government’s rush to win the various nuclear races, neglected to build at any point. (A practice Oliver sums up as like living in a house with no bathrooms, shitting in paper bags, and praying they won’t leak.) Yucca Mountain, Nevada, long judged the only suitable place in the entire country to house all of that waste, was finally settled upon at one point—only for construction of the site there to be halted by bureaucratic can-kicking by former Nevada Senator Harry Reid and others. (Current Department of Energy head Rick Perry says he’s on the case, but the clip Oliver shows of Perry on Dancing With The Stars underscores once more how seriously people should take that guy.) 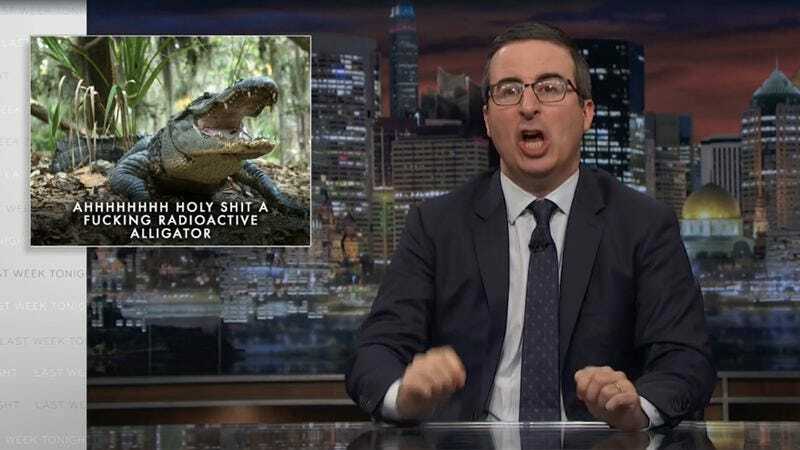 So, while the country deals with the more immediate threats of, for example, the host of Celebrity Apprentice making excuses for actual Nazis, antagonizing North Korea, and having control of the nuclear codes, John Oliver prods everyone to remember that one in three Americans live within 50 miles of a festering, ill-contained heap of lethal radioactive garbage. The rest only have to deal with atomic-powered killer reptiles. Sleep well. *An earlier version of this article misidentified the state dealing with radioactive alligators as Missouri. There are actually radioactive alligators in the waters of South Carolina, at present. Apologies for the error.